Ordered by Standard Steam Fishing Co Ltd, Grimsby as the SANNYRION. Requisitioned by The Admiralty on the stocks, no instalment monies paid. 10.2.1917: Launched by Cook, Welton & Gemmell Ltd, Beverley (Yd.No.358) (non-standard “Mersey” class) for The Admiralty as JOHN ARTHUR (Ad.No.3613). 16.12.1919: Registered by The Admiralty at London (Part I) O.N.143963. 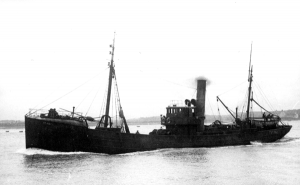 1919: Engaged in commercial trawling on an opportunity basis. 1920: Allocated to the National Fishery Scheme for the setting up of the Minesweepers’ Cooperative Trawling Society Ltd, London. 03.02.1920: Registered by The Admiralty at London (Part IV) (LO299). 05.1921: At HM Dockyard, Pembroke fitted out for fishing under Special Survey of Lloyd’s Register and classed 100A1 Stm Trawler at Milford. 01.1922: Scheme abandoned, the necessary working capital of £100,000 having not been subscribed. Laid up. 1.1923: Sold to Fleetwood Steam Fishing Co Ltd, Fleetwood. 19.1.1923: Registered at Fleetwood (FD423). 22.2.1923: Registered at Fleetwood as GLADYS (FD423). George E. J. Moody, Grimsby designated manager. darkness no further attempts were made. Drifting throughout the night with NOREFJORD standing by, at first light and within three miles of the rocky shore of the island of Sydero managed to get a line onboard and commenced tow to Torshavn Harbour beaching on arrival. SOLA arrived from Fleetwood with a replacement propeller but with only a small tidal difference at low water it was not possible to fit the propeller. Decided to tow back to Fleetwood. In bad weather and with very limited food supplies the tow took five and a half days with the hawser parting twice. 1926: Sir George E. J. Moody designated manager. 25.4.1932: Arrived Fleetwood from St. Kilda ground in tow of FLORENCE BRIERLEY (FD105) having damaged propeller. 1938: Will B. Moody, Grimsby designated manager. William Moody Kelly, Fleetwood, managing agent. 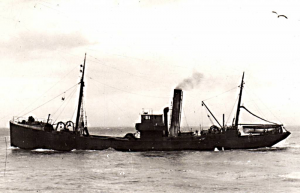 29.11.1939: Requisitioned for war service as a boom defence vessel (Hire rate £83.8.4d/month). 23.11.1943: Compulsorily acquired by M.O.W.T. 1944: Based at Fort William (D. MacBrayne Ltd, Glasgow, agents). 1946: Laid up at Fort William. 16.4.1947: Advertised for sale by tender and open for inspection. Not to be resold within two years. 1947: Sold to Jones Buckie Shipyard Ltd, Larbert, Stirlingshire. 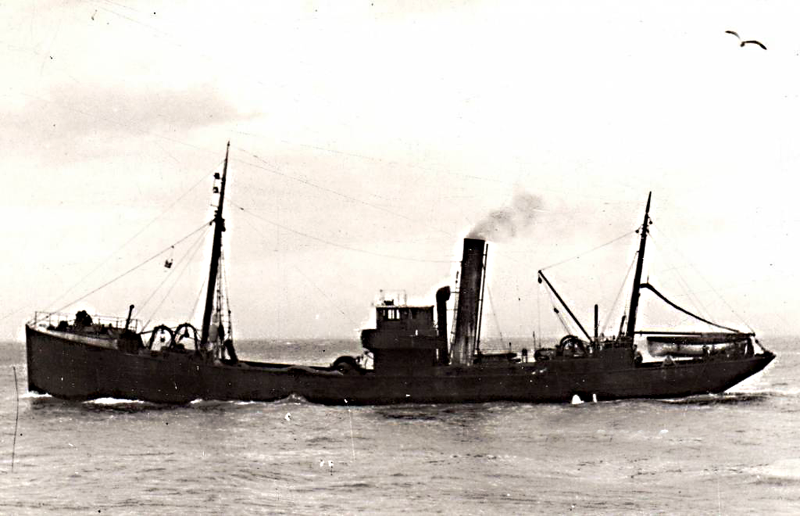 1947: Registered at Buckie as THE BRUCE (BCK179). 1949: Sold to Joseph Croan, Newhaven, Edinburgh. Post 6.1949: Buckie registry closed. Registered at Leith (LH21). 6.1960: Sold to BISCO and allocated to G. & W. Brunton, Grangemouth for breaking up. 28.6.1961: Breaking up commenced. Leith registry closed. 21/01/2008: Page published. 3 updates since then. 08/05/2017: Removed FMHT watermarks from images. This entry was posted in Steam Trawlers, Steamers (Picture) and tagged Fleetwood SFC, Mersey Class on January 28, 2009 by Fred Smith.